Affiliation: APEX Labs, Circle of R.O.P.E. Doctor Tinker was a brilliant doctor, geneticist, and bio-molecular engineer. Born in Estonia, she immigrated throughout Eastern Europe in her youth and crossed paths with the likes of several other notorious scientists, including the famed scientist Adriene Herrin. During her studies, she began to view the limits of man as a challenge to surpass and quickly devoted her life-long ambition to improving upon human perfection, intent on making gods out of mortals. Sadly for her, her ambitions were deemed too costly and too unethical to ever receive funding or support from any legitimate organization. She would not be denied her dream, however, and she had no qualms about turning to the shady underworld, promising terrorists she could create super-soldiers and assuring rich millionaires she could improve and perfect them where nature and God had failed them. Unfortunately for her contributors and volunteers, they existed only as guinea pigs for her to test her unproven theories upon. Rather than creating a master race she instead produced horrifying monsters and mutants. Still, she turned her lemons into lemonade and used her brutish creations to commit crimes for her to further fund her experiments, blackmailing her creations instead with the promise of restoring their humanity if they served her well enough. Eventually, her crimes grew too big and widespread and she was forced to flee to the sanctuary of Metrobay, where her unethical experiments quickly netted her a position with R.O.P.E. at APEX Labs. 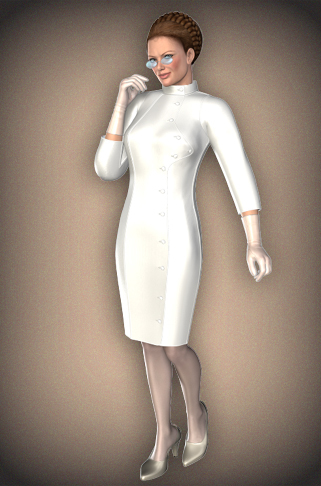 With the funding of Max Indeks, she was able to keep a low profile, and with a bevy of captured, kidnapped women sent to her labs she was free to experiment on them to her heart’s content until she had achieved desirable results. Recently, she was approached by the villain Bronk, who despite his own genetic alterations and substance-assisted physique, was despondent to discover his strength wasn’t enough to defeat many heroines. Despite knowing her reputation and the risks involved, he volunteered to be her newest guinea pig, to become stronger at any cost. Never one to refuse an opportunity, Doctor Tinker gladly accepted the proposal and went to work. Earlier at some point she stumbled across the disembodied Miasma Man in his gaseous form and created the containment suit that allowed him to interact with the outside world. Together they sought a cure for his condition, and the demented genius grew infatuated with her villainous cohort and the two entered into a twisted relationship. However, as they neared the end of discovering a cure, Virginia has begun to question whether Miasma Man would stay with her once he no longer needs her to help with his cure. It was recently revealed that Virginia has a husband, the forever APEX scientist Doogan Tinker, currently the supervillain the Changeling. It appears as if her “love” for other freaks, like Bronk and Miasma Man, might in fact simply be a ruse, and Virginia continues to hide the notorious villain away from the others, who only appears to her. The two appear to be quite intimate, though Doogan is prone to being bossy. Recently, Virginia has developed feelings of inadequacy due to her lack of stature compared to other women in Metrobay. To make her look and feel better, the scientist has undertaken a plan to enchance her own physique at the expense of the most legendary buxom heroine in Metrobay – Ms. Metrobay.